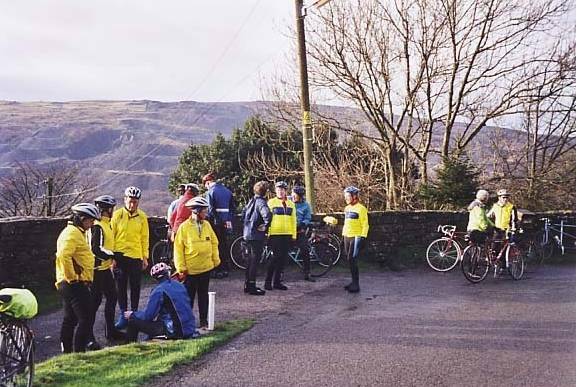 The Tandem Club New Year rally 2003 was held at Llanberis, North Wales. The event was based in Llanberis Youth Hostel and had options of short, medium long rides on each of 29th, 30th 31st December. 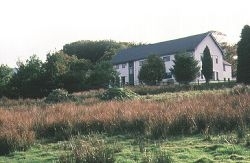 The hostel overlooks lakes and has views toward Snowdon summit. Only 1/2 mile from the village of Llanberis with the Snowdon Mountain Railway, Padarn Country Park and Electric Mountain. Low level and mountain walks start in the vicinity of the hostel. 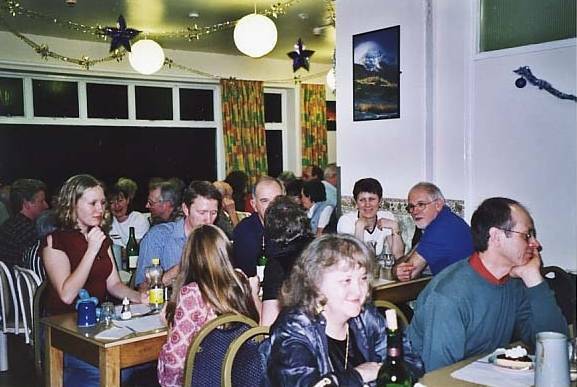 46 members joined Alan & Jeanne Ashcroft at the Llannberis Youth Hostel in North Wales for the 3rd event which they have organized for the club at this time of year. The warm and comfortable accommodation was enhanced even further by an amazing team of chef/wardens who contributed greatly to the super atmosphere. A full menu of beautifully cooked and presented meals was offered for breakfast and dinner with so much variety that it was sometimes difficult to choose from the list. Sunday was typically wet and murky and most riders donned walking boots for local exploration. Despite the closure of many tourist attractions the Slate Mining Museum was open as was more importantly the most amazing café. "Pete's" is located in the main street of Llanberis and is a model for others to aspire to. Clean and spacious, with well cooked food from an extensive menu. Quick service with all the newspapers to read, it was difficult to get up and go out! It deserves its reputation with the climbers and walkers. Every town and village should have one! A few teams cycled the Llanberis pass route round Snowden to test their waterproofs, but it was on Monday that the whole crew turned out for a hilly ride to Bangor and the Menai Straits. An unfortunate tumble spoiled Margaret Welch's day, resulting in a cracked bone in her upper arm. An emergency car pickup service was provided by Bill Barnes and daughter Rosalind. Margaret spent the rest of the day in A & E whilst the remainder checked out yet another café in Menai for lunch. All this eating! We had to ride to work it all off. Back to the hostel for hot showers and some quizzes, convivial chat and, yes, more food. A choice of rides was offered on Tuesday with some of us opting for the Sunday's "Snowdon Ride" to get the views, as the day was clear. Another route headed toward Caernarfon. The climbs were worth it with great views and chilly descents but those café stops were once again, a welcome respite for cold feet and hands. New Year's Eve was celebrated with an excellent dinner provided by the beaming (must have been that bottle of champagne!) wardens and traditional greetings exchanged at the stroke of midnight. A presentation was made to Jeanne & Alan (who's downhill speed still breaks records!) the wardens and Luke & Becky (local RO's) who helped organize the routes. 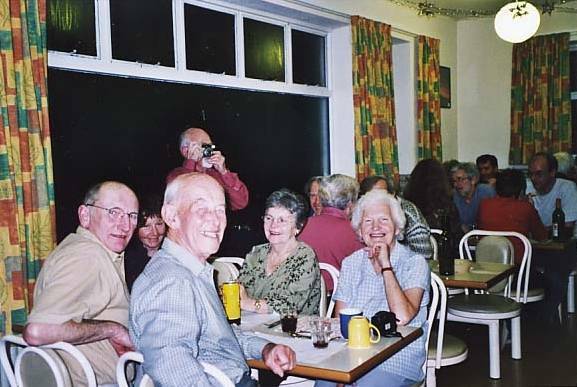 We all went home after a later breakfast next morning with some having to contend with rail strike problems, but all having enjoyed a great time. Hopefully Margaret will be fully recovered for her trip to Morocco in February.